Please note that this year's walk includes the Full Moon, Mohammed's Birthday, Purim and the Christian Holy Week. 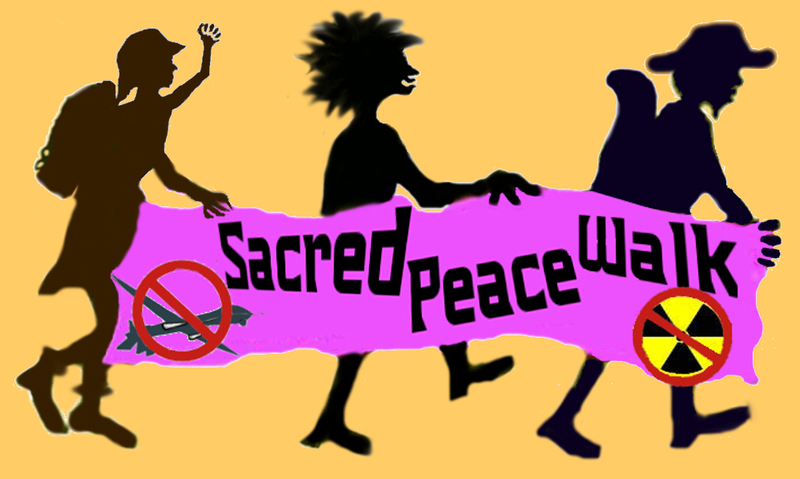 We walk in the footsteps of a long legacy of peace walkers and spiritual leaders to draw attention to the nuclear dangers that continue to threaten our sacred planet and the community of life. Please join us in transforming fears into compassion and apathy into action in NDE's 2008 Sacred Peace Walk. NDE's 62-mile, annual pilgrimage to the Nevada Test Site will begin on March 17th as we gather in Las Vegas and prepare for our six-day walk starting on March 18th. The main Walk ends on Sunday, with an extra special action on Monday for those who can hang out longer in the desert. Take Hwy 95 North out of Las Vegas. 65 miles out of town you will see the Mercury exit (past Indian Springs and Cactus Springs). Take the Mercury exit, and as soon as you can make a U-turn and drive under the freeway, to the west (if you keep going down the road without making a U-turn you will come to the legal boundary of the Nevada Test Site). The DOE plans to revamp US nuclear weapons facilities to rebuild every weapon in the stockpile under its Complex 2030 plan. . . . The US is actively seeking new warhead designs for new warfighting scenarios under the Reliable Replacement Warhead program. . . . The U.S. Department of Energy (DOE) continues to explode subcritical nuclear test bombs at the Site. . . .
Could 2008 be a turning point toward peace?